for the launch of the English translation of Kreyòl novel Dézafi. Join Assemblymember Rodneyse Bichotte as we celebrate exceptional women in our community. Presenters: Mistress of Ceremonies Farah Louis, Special Presenter Professor Mojúbàolú Olufúnké Okome. RVSP in advance via e-mail or telephone, 718.940.0428. Space is limited. For more information about this even or any community concern, contact Assemblymember Bichotte's district office. My Soul Is in Haiti poster. 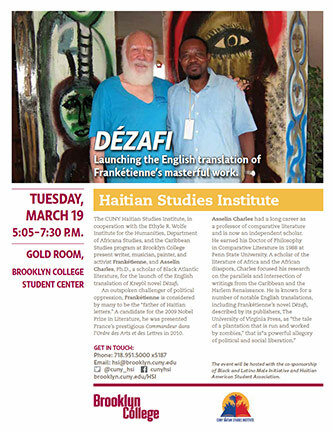 Haitian-American anthropologist and author Bertin M. Louis Jr, will discuss his latest book, My Soul Is in Haiti: Protestantism in the Haitian Diaspora of the Bahamas. Join Professor Louis for an evening of conversation on the topic of religion and the growth of forms of Protestantism in the Haitian communities of the Bahamas. Louis will cover the topics of the religious identity in the Bahamas and analyze the reasons why Protestantism appealed to the Haitian diaspora in the region. Haitian-American Anthologist, Poet, Feminist, Performance Artist, Activist and Professor of Anthropology at Wesleyan University will be giving a talk within the interdisciplinary & intersectional field of Haitian Studies.